While I really enjoy a drink of wine, I am pretty fussy about which wine I drink so I suggested perhaps a trip to Dan Murphy's and then a BYO establishment might be a good option. Mum suggested Fusion 51 which I remembered being hearing about from some of my old Townsville friends who told me that it was owned by another old Townsville friend of mine Peter Heilbronn. I need to apologise in advance for the lack of photos for this entire post, I am still getting used to this whole blogging thing and get so annoyed with myself after enjoying a fantastic meal and then realising I didn't take any photos! I was actually very surprised to be greeted by Peter who recognised me immediately, it must have been 15 years since I last saw him so I am taking it as a compliment that obviously I am ageing well. What followed was a fantastic and very relaxed dining experience that was highlighted by a deliciously succulent pork belly and asian noodle salad and also some superb salt and pepper style deep fried calamari that Peter told us the secret is in the slicing of the calamari. I definitely agree with him there. There were other lovely dishes served but these two were the standouts for me. Oh and the prawn wontons, they were also excellent with nice crispy skins and a tender moist prawn filling. We complimented this wonderful food with a bottle of Kooyong Estate Pinot Noir 2008. It matched the food perfectly (but what food doesn't Pinot match perfectly) although I did have to ask for an ice bucket as Townsville room temperature is a bit hotter that the Melbourne room temperature that I am used to. Dessert was also delicious and the grilled mango was something I hadn't seem previously but will definitely order again if I get the chance. So by this stage I was very impressed and our weekend was off to a great start. Dinner that evening was a Queensland specialty that you don't see often in Melbourne, crumbed fish and chips. Melburnians love their battered and grilled fish but for some reason crumbed fish doesn't get mush of a run. I'm normally a battered man myself but as I was in Nth Qld I thought I should go for the local specialty and I was glad that I did. It was exactly as I remember it with a beautifully crispy brown crumbed coating that hugged the moist flesh of the fish, why does my crumb never stick like that? Again no food pictures? What was I thinking??? I did get a few of me and Charlie though, Townsville was so green and tropical, Tina and I both commented how different it was to the dry place where we grew up in the 80's. The Strand redevelopment is just wonderful and probably the best thing that has happened to Townsville in decades. 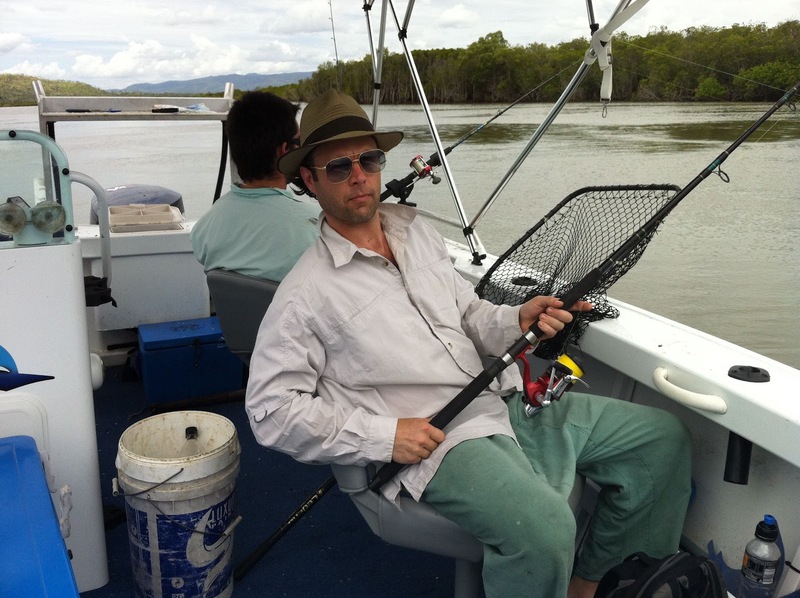 The next morning I had arranged to go fishing and crabbing with my cousin Dayne and his stepfather Demi at Alligator Creek. I don't know about alligators but we did see a few decent sized crocodiles so I definitely kept all appendages well within the boat! It took only about half an hour to get to the creek and launch the boat which coming from Melbourne I thought was just great. One of the really special things about Townsville is how easily you can leave the town behind and be relaxing in nature. I started strong and within minutes had landed the first catch on the day, unfortunately it was the first of many catfish which the boys instructed me to return to the water as they are not good eating. Being a bit of a Thai foodie I personally would have kept them and tried grilling them over charcoal but as we expected to catch many more better fish I didn't mind returning my first catch to the water. Unfortunately despite trying a few spots we didn't catch anything worth keeping although Dayne claims to have caught and released a large Salmon but actually it bit his line and escaped so I'm pretty sure it doesn't count. I did see it come to the side of the boat and was starting to think about how it could be cooked only to see it disappear under the water with Dayne restraining himself from jumping in after it. 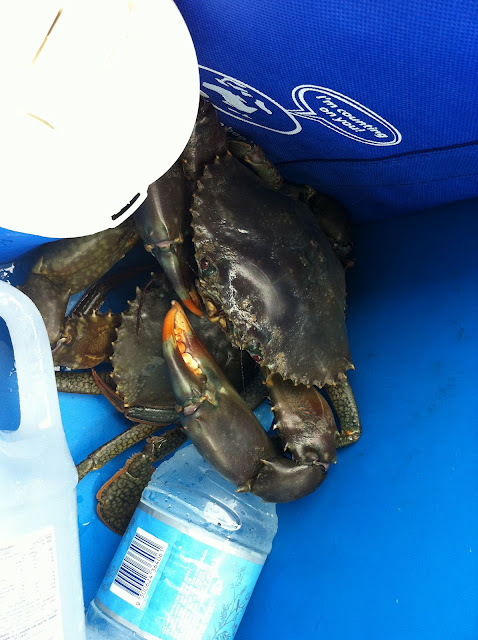 Although we didn't have a lot of luck with the fish we did mange to get a few legal size crabs in the pots so all was not lost. Demi kindly let me take a couple home that I kept for dinner the following night. I really enjoyed the morning fishing, it has been ages since I've been fishing and its something that I find very enjoyable and relaxing. Not to mention how good it is to cook seafood that you have caught yourself. 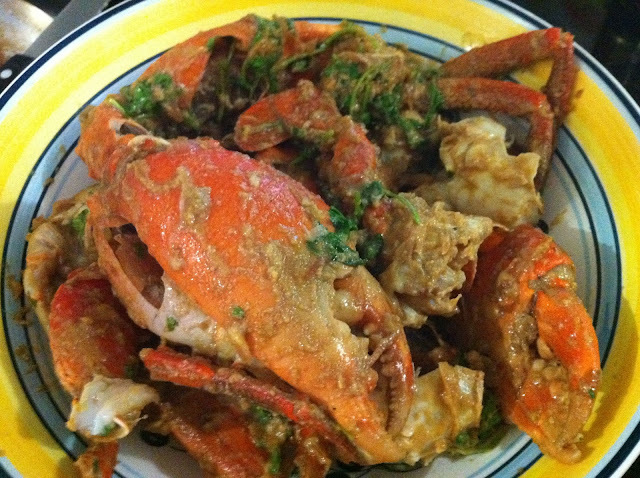 After retuning home and helping the boys clean the boat I decided that I needed some Tamarind soup mix for my mudcrab dinner the following night. Mum took me to the asian grocer on Ross River Road where another fantastic surprise awaited me. 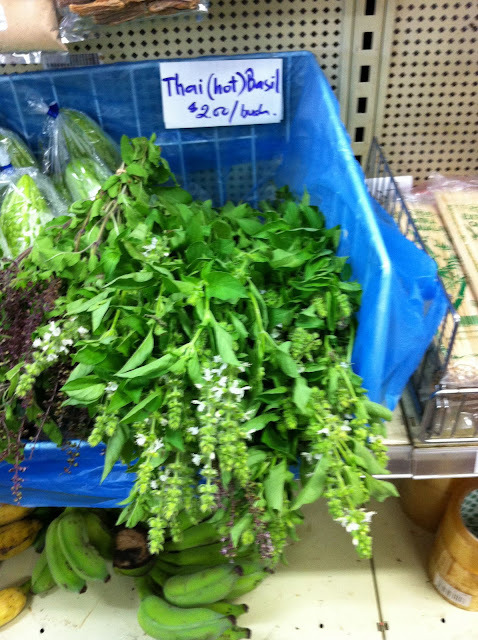 As soon as I entered I noticed some large bunched or Thai Holy Basil (Bai Krapow) that you really can't get in Melbourne. I sometimes see it at Footscray but it is usually a tiny bunch that is blackened with age as it doesn't keep well. 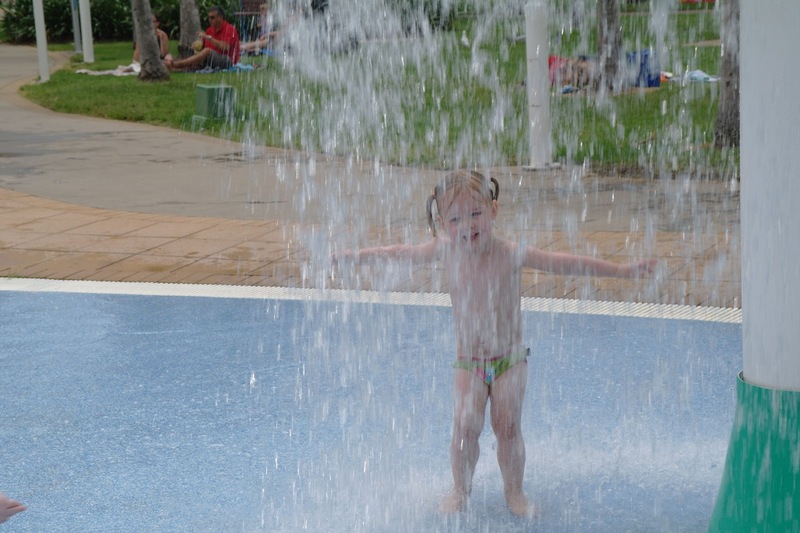 It certainly paled in comparison to the huge luscious green bunches available in Townsville. Also very exciting for me were the beautiful little Thai cucumbers that I have never seen in melbourne. They were identical to those we ate in Thailand and you can see them in the background image of this blog (yes I didn't take a photo, another blogger fail). 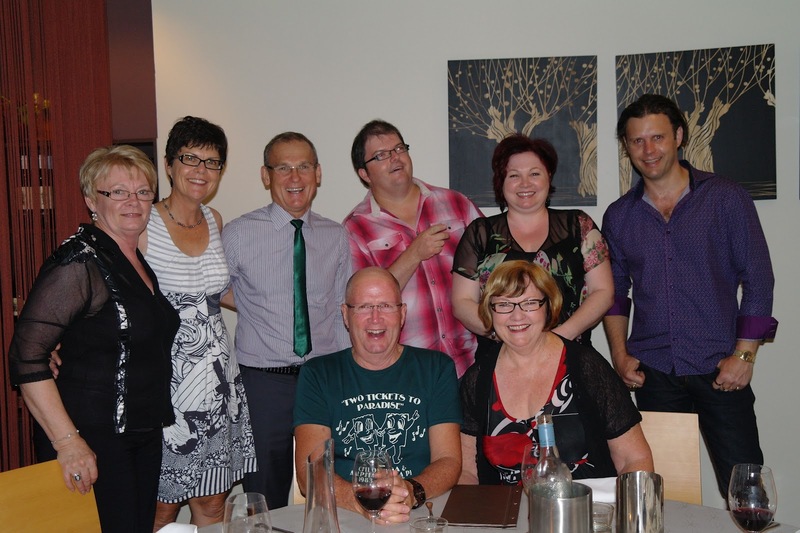 That night we went for dinner at 'A Touch of Salt' for Bazza's retirement party. Dinner was superb, Tina and I shared the Oyster Duo which was 3 Tempura with Miso Mayonnaise and 3 Natural with Wakame Salad and Tobiko. I love oysters and these were both wonderful, I am a sucker for fried food so the Tempura were my favourite. For entree I had the Seared Scallops with Goats Cheese & Ricotta Gnocchi, Pumpkin, Muscatels, Pine Nuts, Brown Butter, Crisp Sage. The scallops were lovely and plump but my only criticism was that I thought the dish was a bit oily. 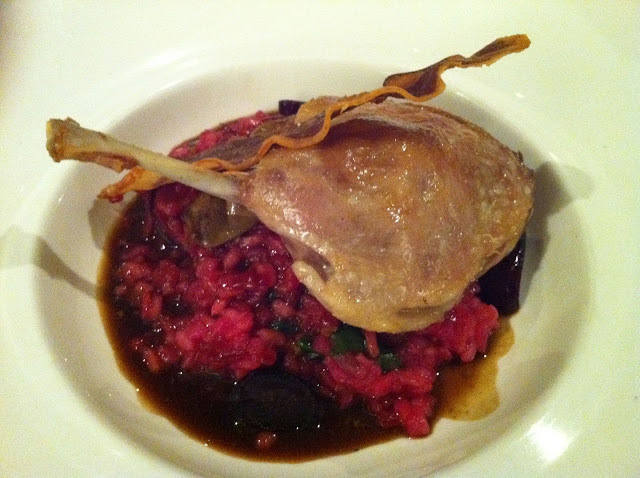 For Main I had the Confit Duck Beetroot Risotto, Roast Baby Beets, Chard, Pancetta Crisp, Jus Gras and it was excellent. The confit duck was melt in the mouth and the risotto was cooked perfectly with the grains of rice cooked to a perfect consistency. I had a bit of a look around the table and while the other meals all looked great I had to agree with myself that the confit duck was the best option! Tina and I both consulted the dessert menu and as often happens we looked at each other and asked, what do you want? Which is really code for I can't choose and want to know what you are ordering so I can eat some of it too. As so often happens we had both couldn't choose between two desserts so decided to order both and share them. So between us we devoured the dark Chocolate parfait fig carpaccio, caramel ganache and the vanilla bean crème brulee chocolate lavender shortbread. Both were heavenly. I really liked the way the dessert menu was divided into small and large desserts, you don't see this very often and I think its a great idea as I pretty much always want dessert but don't always want something large. in saying that I have been known to eat a crème brulee for two all to myself. Luckily for me (and maybe a bit because of me) Bazza loves Pinot so it was Pinot all the way with dinner, just the way I like it. We started with the Giant Steps Gladysdale Vineyard (Yarra Valley, Vic) then moved on to the Felton Road (Central Otago, NZ) and finished with the Jones Road Jr Jones (Mornington Peninsular, Vic). All were superb and I was a bit busy enjoying the food and conversation to really taste any of them properly although If I have to choose I would go with the Jr Jones. It was actually the cheapest with the Felton Road the most expensive but I am just so biased towards Victorian Pinot that it never really had a chance. All in all it was a really fun night, I would definitely recommend 'A Touch of Salt' to anyone visiting Townsville and looking for a fine dining experience. What made the experience even better was the semi private dining room, just subtly separated from the main dining area by a beaded curtain. I found it nice and private with the sterility that you sometimes get from the 'private' dining room. The next morning we headed to the Cotters Market on the recently opened up Flinders Street Mall. It isn't the biggest of markets but what I really like about it is the farmers that come from the surrounding towns bringing their wonderful array of locally farmed produce. I love sugar bananas and will buy them whenever I see them. Not so much the ladyfinger variety but the smaller sugar bananas with the thin skins. You don't see them sold very often in Melbourne although you can occasionally get them at Footscray and sometimes even the Victoria Market. I found a bunch immediately and reluctantly shared them with Charlie. I also bought some delicious Rambutans, again they were reluctantly shared with Charlie. 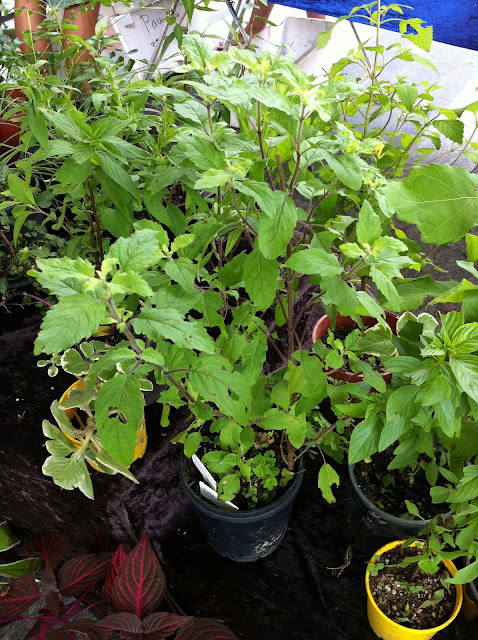 the same stall had some fresh herbs in pots for sale and when I saw a Holy Basil plant for $5 I started trying to work out how I could get it on the plane back to Melbourne. Other highlights were the lovely bananas in sticky rice wrapped in banana leaves. I love this treat and will definitely be cooking it myself at home if I can only work out what bananas are used, they seem to be a light purple colour so I'm a bit stumped on that one. The same stall had native eggplants for sale so I grabbed a bag of those. The man at the stall asked me if I knew what they were and I replied that they were pea eggplants and often used in Thai curries. He seemed satisfied with that and as I left I heard him say to his wife, "pea eggplants, that's a better name". I also bought some lovely little scud chillies, a head of Thai garlic and some very hot long red chillies. I was only staying one more night so Mum and I a lot of cooking ahead of us! By this stage you can imagine I was pretty excited about all of my goodies so I headed back to meet up with my parents and Grandad who had come over from Maggie Island to see us. 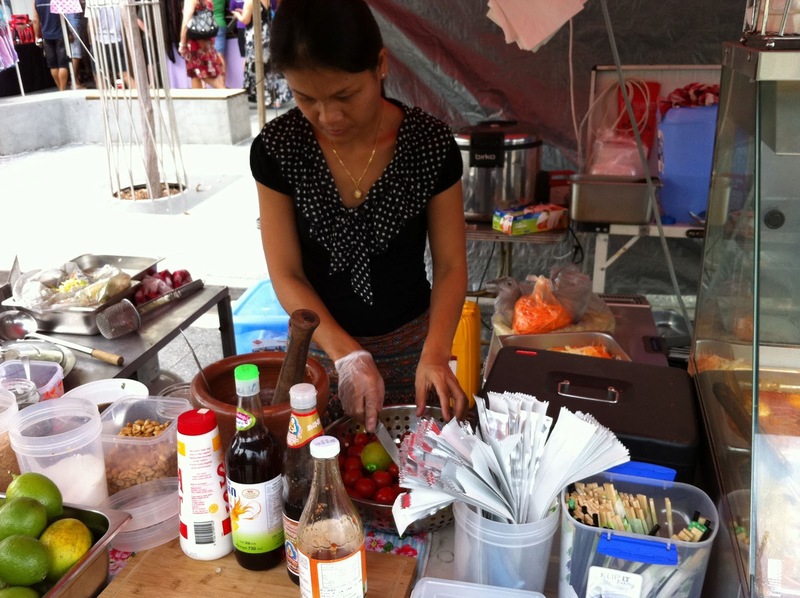 While making my way there I spotted a stall selling Thai food with a lady standing over a Thai mortar and pestle that I immediately recognised as the type used to make Thai Papaya Salad (Som Tam). At $8 a serve (it didn't matter what is cost really) I scratched up the last of my money and borrowed a bit from Mum and ordered a serve. I then stood and watched as the lady deftly sliced some tomatoes into the pestle and added the shredded papaya and carrot and carefully added the tamarind water, lime juice, palm sugar and fish sauce, some chillies and finished it off with some peanuts then tasted the sauce to check it was properly balanced. I just knew it was going to be good, and I wasn't wrong. This was easily the best Som Tam I have eaten outside of Thailand! So deliciously spicy and sweet with a lovely balance of sourness and a beautiful crunch from the papaya and peanuts. 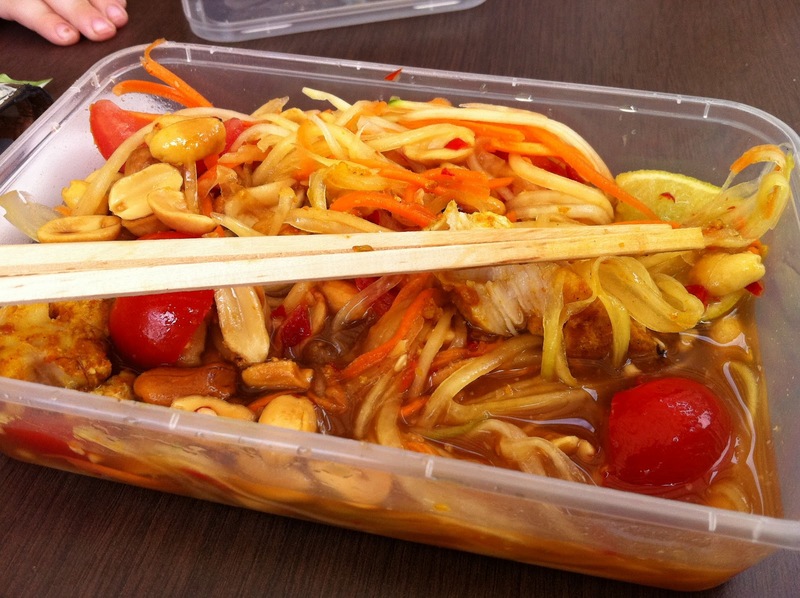 I also purchased a chicken satay (minus the sauce) as I think Som Tam is best served with grilled chicken (Gai Yang) and although it wasn't authentic grilled chicken it went perfectly with the Som Tam. This was the highlight meal of the weekend for me. My only disappointment was that I didn't have room or time to try all of the dishes on offer. I'm sure the Mussaman curry, Green Chicken curry and Thai Chicken Noodle Soup would all be superb! 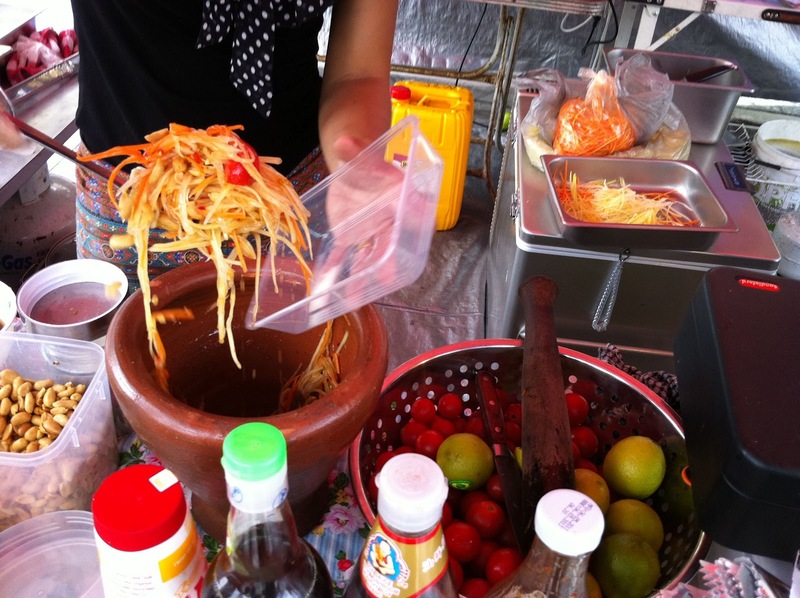 The Som Tam certainly was! 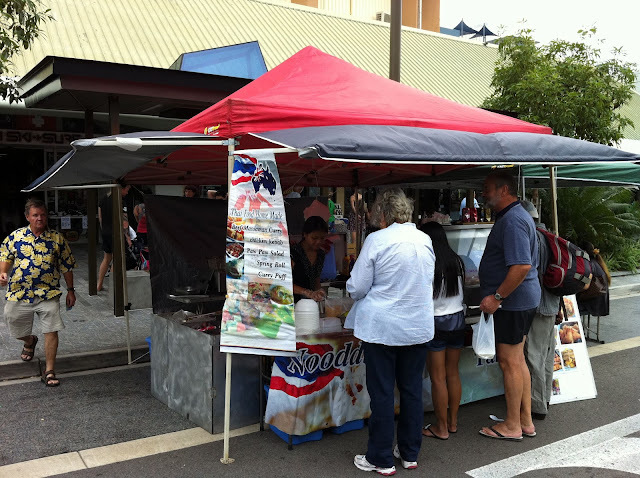 So if you are ever in Townsville on a Sunday head to the Cotters Market and go straight to the Thai food vendor just in between the Cowboys Leagues club and the sugar shaker. You won't be disapointed. 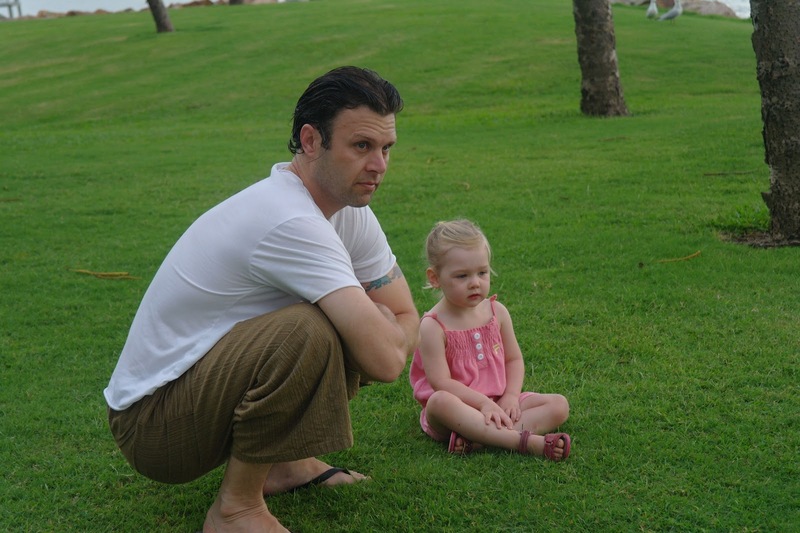 Next was the Christening where I officially became a Godfather. After the ceremony we wandered down to the Strand and while the kids played in the awesome water park Bazza worked his magic on the BBQ. 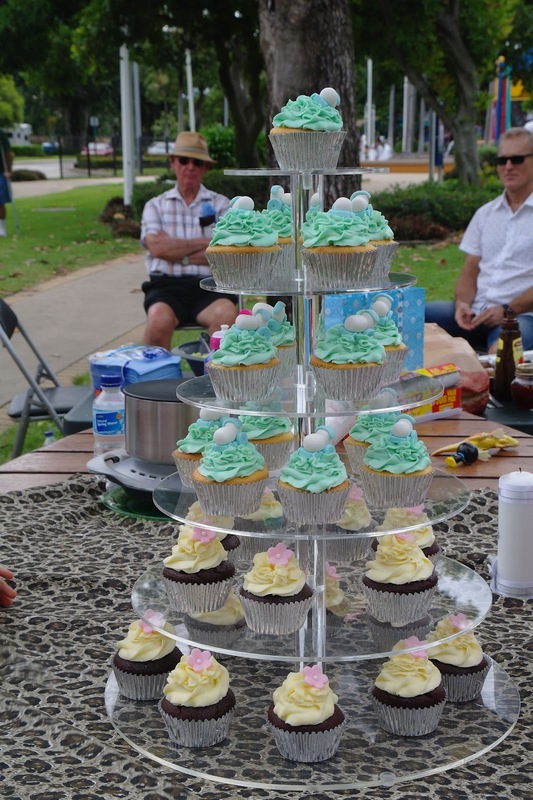 Not long after I finished smashing a couple of burgers with BBQ sauce, Diane unveiled the sensational Cupcake tower! If I had known I might have held off on that second burger. I normally don't get too excited about cupcakes but these were the some of the best I can remember eating for sure. The chocolate cupcakes were really special. Sometimes cupcakes can be 'all show and no go', a bit like my crossfit style really. But not these cupcakes, they were 'all show and all go!' I ate two but could easily have doubled that and probably would have if those scales weren't in the spare bathroom at my parents house. I had gradually watched myself add 2 kilos over the course of the weekend! After lunch we headed back to Mum and Dad's and started preparing for that nights feast. Mum cooked up a fantastic Vietnamese papaya salad with prawns and crunch salty fried whitebait. The fried whitebait adds a really special crunchy saltiness to the salad, thanks Luke Nguyen for Songs of Sapa (and you too Mum). Mum also cooked a great Chiang Mai fish curry with I think was mackerel. I thought this was a great fish for curries as it held together really well and had a string enough flavour to hold itself in a strongly flavoured curry sauce. The pea eggplants from the market were used in this dish and Mum reckons she might have slightly overcooked them although they tasted great to me. I had a bunch of Holy Basil to use and a nice bag of scud chillies so of course it had to be Pad Krapow. I was pretty relaxed about the whole thing until I tried to buy pork mince. Four supermarkets later and only Pork and Veal 50/50 mix in sight I was getting a bit worried. What's with the Pork and Veal mince mix? Apparently it is perfect for Bolognese according to the label complete with Raguletto branding, cue conspiracy theory. I settled for some pork strips and with the help of Bazza and Di's Thermomix I had my pork mince in about 10 seconds. Of course, no Pad Krapow is complete without few wok fried runny eggs on top. It was lovely and spicy and a bit too spicy for some but the sliced raw Thai cucumbers were the perfect accompaniment to subdue the heat. If that wasn't enough we also had the wok fried mudcrab in sweet tamarind sauce. What a feast and a great way to end a wonderful weekend of fun, food and family (and wine)! Dinner was of course accompanied by a couple of bottles of Pinot starting with the Fulcrum Gippsland Pinot by Bill Downie and then a bottle of the 2008 Passing Clouds Pinot from Bazza's selection. The next day we headed home exhausted and for dessert that night I smuggled back a couple of the banana sticky rice wrapped in banana leaves treats that I heated up with some sweet coconut cream sauce, so so good! So that ends our weekend of feasting in Townsville and also my entry for the world's longest blog post! Now its a week of crossfit to try and undo the weekend's damage! Over and out. Your journey seems to be really interesting, especially the fishing part. Even I enjoy fishing and it is so much fun. And the food, it looks delicious. You have done a great blog post.